$600 Instant Savings. Expires May 30, 2019. * All prices reflect savings. Travel on an Optional 3-night Phuket extension! 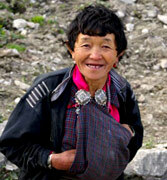 Come with us to experience a once-in-a-lifetime guided tour of Bhutan. This is one destination that even the most seasoned travelers consider a privilege to visit. Perched high atop the mighty Himalayan range, the Kingdom of Bhutan has defied globalization and remains a hidden paradise. Although it consistently ranks as one of the world's top destinations, its remote location and strong preservation efforts make it accessible to only a fortunate few. 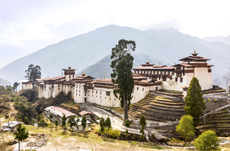 Our Beautiful Bhutan tour package makes it possible for you to not only visit this enchanting land, but also immerse yourself in its rich cultural traditions. Experience the enchantment of Bhutan's ancient fortresses, monasteries, and temples, the richness of its artisan traditions, and the beauty of its pristine natural landscape as you traverse the country's mountainous terrain. This unique program also provides ample time to interact with the friendly people of Bhutan, including a very special opportunity to join hundreds of Bhutanese in their celebrations of the spiritual festivals. You're sure to leave with an enlightened understanding of the country's national philosophy of "Gross National Happiness." Instant Savings: Get $600 off if you book by May 30, 2019! The itinerary below is a sample. Your actual itinerary may vary based on the specific Bhutanese festival or mock Bhutanese festival celebration scheduled for your departure, listed below. For more information about a specific departure, please contact us. On The Blog: Learn more about each of these fascinating Bhutanese celebrations! *Note the April 28th departure will operate with a slightly different sequence. 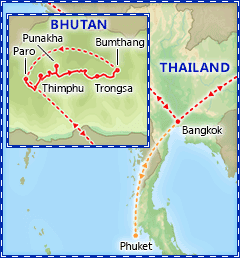 Your exotic journey to Bhutan begins this evening as you check in for your flight to Bangkok, via Taipei. Accommodations: 2 nights COMO Metropolitan or similar, Bangkok. Included meals: Dinner. Full Day Itinerary: This morning arrive in Bangkok, the bustling capital of Thailand, situated on the banks of the Chao Phraya River. After customs formalities, transfer to your centrally located hotel for check-in. This evening take a short walk from the hotel to an authentic local restaurant. 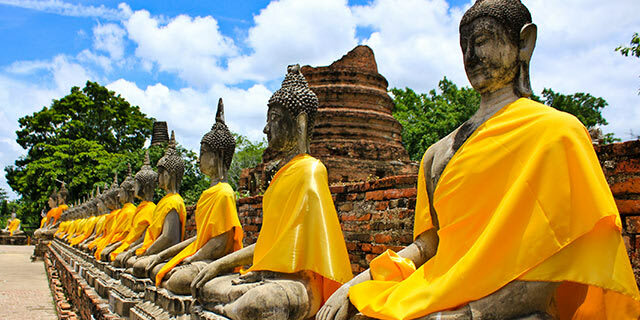 Full Day Itinerary: Temples, along with the monarchy, are the fabric that binds together the national identity that is Thailand, and some of the most interesting of Thai temples are found in Bangkok. This morning, depart for The Grand Palace and the Temple of the Emerald Buddha. For 150 years, the Grand Palace, served as the residence of the King and his court as well as the entire administrative seat of government. Within its grounds, you'll also visit the Temple of the Emerald Buddha (Wat Phra Kaew), a structure built to house a large Buddha image carved from a solid piece of green jadite (jasper). Continue to Wat Po, founded in the 17th century and the oldest temple in Bangkok. This temple is also home to the amazing Reclining Buddha, one of the largest in the world, whose face depicts the attainment of Nirvana and whose feet are inlaid with mother-of-pearl. Balance of the day is at leisure. Optional Excursion: Chinatown Walk, $35 pp (purchased locally) This afternoon, drive to Chinatown square where you will start an exciting walk through one of the oldest parts of Bangkok. Walk along Yaowarat Road where you'll visit interesting shops selling unique objects. Continue to an old tea shop to enjoy a cup of Chinese tea with the locals before heading to Talad Kao for a busy local market with a variety of fresh food, fruits, and Chinese herbs. End the walk at Wat Leng Nei Yi to visit the Taoist temple, and continue to Wat Trimitr on the edge of Chinatown, which houses the world’s largest solid gold Buddha. Optional Excursion: Calypso Cabaret Show, $45 pp (purchased locally) This evening, transfer to the Thai dance show at Calypso Cabaret, one of Bangkok’s renowned shows. Calypso Cabaret is located at Asiatique the Riverfront, which is a famous night venue for dining, shopping and entertainment, and features a unique setting with a panoramic view of the Chao Phraya River. Afterwards, transfer back to your hotel. Accommodations: 2 nights Osel Hotel, Thimphu, Bhutan. Included meals: Breakfast, lunch & dinner. Full Day Itinerary: Transfer to the airport to continue your journey to Paro, Bhutan via Druk Air. On a clear day, you may experience breathtaking aerial views of the Himalayas. 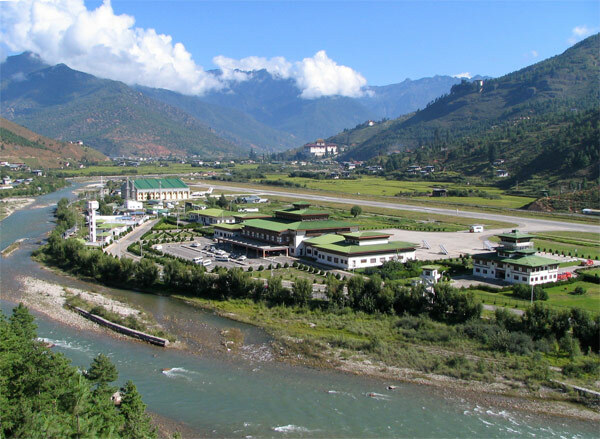 A representative will greet you upon arrival at Paro International Airport. After customs formalities, board your vehicle for the scenic drive to Thimphu, Bhutan's capital city, passing through a bucolic landscape dotted with rice paddy fields, apple orchards, and quaint villages. Time permitting, enjoy a panoramic tour of Thimphu Valley upon arrival. Thimphu is situated at an elevation of 8,200 feet. On your way to Thimphu and if time permits, make a stop at the Tachogang Temple, built in the 15th century by Thangtong Gyalpo, builder of many iron bridges in Bhutan. After this visit, continue your drive to Thimphu. Full Day Itinerary: Your first full day in Bhutan begins with a visit to the National Memorial Chorten, built in honor of King Jigme Dorji Wangchuck, and the Dupthop Lhakhang Monastery. Continue to the National Library, a fascinating repository of numerous ancient Buddhist manuscripts, and the city painting school where students are trained in the traditional art of painting Thangkhas (sacred Buddhist religious scrolls). Then, proceed to the traditional Medicine Institute to learn about ancient Bhutanese healing practices. After lunch, visit Lungtenzampa, where you'll have the opportunity to observe the traditional royal silversmiths and papermakers at work. 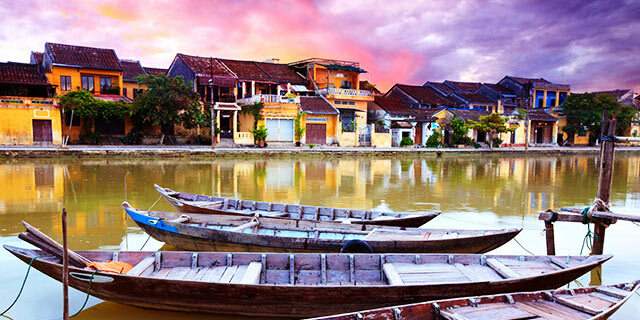 Return to town to visit the handicraft stores and stroll around the tiny capital city. Overnight at Hotel. *Itinerary may differ depending on the day of the week. Kindly refer to your final documents for the confirmed itinerary. 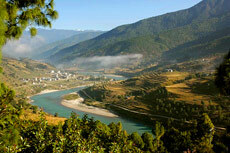 Accommodations: 1 night Drubchhu Resort or Zhingkham Resort, Punakha. Included meals: Breakfast, lunch & dinner. Full Day Itinerary: Today, drive to the town of Punakha, making scenic stops along the way. Take in sweeping, panoramic views of the snowcapped Himalayan mountain ranges at the Dochula Pass. Continue driving to Lobesa, where you'll hike up a small hill to the Chimi Lhakhang, a temple dedicated to Drukpa Kunley, the great 14th century Yogi, commonly referred to as the "Divine Madman." Locals believe that this temple blesses women seeking fertility. Depending on time, lunch will be before or after the walk. Afterwards, proceed to the majestic Punakha Dzong. Situated between the Phochu and Mochu Rivers ("Male" and "Female" Rivers, respectively), this fortress is the most magnificent in all of Bhutan. In the 17th and 18th centuries, it served as the country's capital. Today, it houses the district administrative and judiciary offices as well as the winter home for Bhutan's spiritual leader, Je Khenpo, and the 600 monks of Thimphu and Punakha. Accommodations: 1 night Yangkhil Resort, Trongsa. Included meals: Breakfast, lunch & dinner. Full Day Itinerary: After a hearty breakfast early this morning, set out on the fabulous drive to Trongsa. 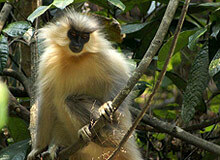 Take in the breathtaking beauty and serenity of Bhutan's diverse, untouched flora and fauna along the way. 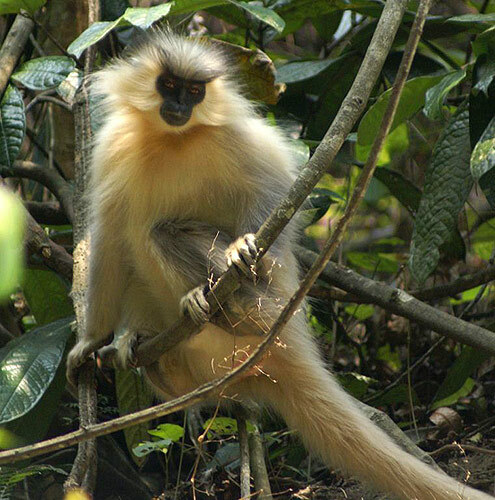 Thanks to its isolation, small population, mountainous terrain, and the national religion of Buddhism, which stresses the sanctity of all life, Bhutan has protected virtually all of its forests and wildlife. As a result, this tiny kingdom, in contrast to all of its neighbors, possesses the last truly intact, large-scale ecosystem in the Himalayas. Drive through the semi-tropical vegetation to Pele Pass (elevation of 10,989 feet), traditionally considered the boundary between West and East Bhutan. From here, continue through an alpine forest of rhododendrons and dwarf bamboo to the Chendebji Chorten, a large 18th century Buddhist monument constructed by a Lama to cover the remains of an evil spirit that was believed to terrorize inhabitants of the valley. As you approach Trongsa, gaze in wonder at its huge fortress, or Dzong, that sits on a narrow promontory that juts out over the gorge of the Mangde River. The view from this Dzong extends for many miles, and in former times nothing could escape the vigilance of its watchmen. Check in at your resort hotel, offering superb views of the soaring mountains and majestic Dzong. Accommodations: 3 nights Yugharling Resort & Spa, Bumthang. Included meals: Breakfast, lunch & dinner. Full Day Itinerary: After breakfast, visit the majestic Trongsa Dzong, built in 1647 by Shubdrung Nawang Namgyal. This Dzong was the source of many important historical events in the making of Modern Bhutan. You will be dropped off at the junction in the road to the Bazaar and the Dzong, and walk from here to the Dzong. After the visit, drive to Taa Dzong, an ancient watchtower that is now a museum dedicated to the Kings of Bhutan. After lunch at the hotel, drive to Bumthang, crossing the Yotongla Pass into the first of four valleys of Bumthang known as Chumey. Stop at the Tsungney village to learn about Yathra weavings and continue to your hotel in the Chokhor Valley. Time permitting, stop at the Chamkhar Bazaar. From here, you can walk back to the hotel after browsing the market. 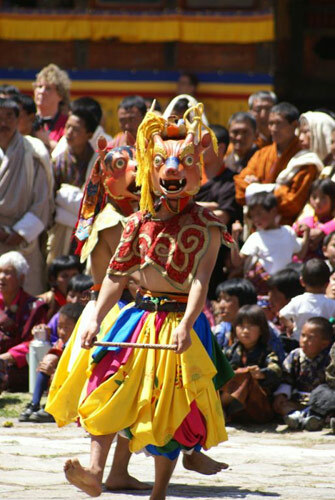 Full Day Itinerary: The festivities begin today as you attend the ongoing Bhutanese Festival. Celebrated annually, these ancient religious festivals serve as a spiritual revival and reminder of the connection between past, present, and future. Accompanied by blowing horns, booming drums, and clashing cymbals, monks and laypersons alike dress in brilliant costumes to perform spiritual dances and re-enact legendary events and moral vignettes in the courtyard of the Dzong. Crowds of people gather in their finest hand-woven dress, made of the brightly patterned cloth for which Bhutan is renowned, creating an intensely colorful and exciting atmosphere that has remained unchanged for centuries. Locals believe that dressing in their finest clothing is another form of offering to the deities that will bring them merit, luck and prosperity. After lunch, your vehicle will drop you at the Kurjey Lhakhang. It is believed that in the eighth century Guru Padmasambhava had meditated here and subdued the local deity known as Shelging Karpo. Begin your hike from here crossing the suspension bridge and visit Padmasambhava Lhakhang. This is another Meditation site of Guru Padmasambhava. 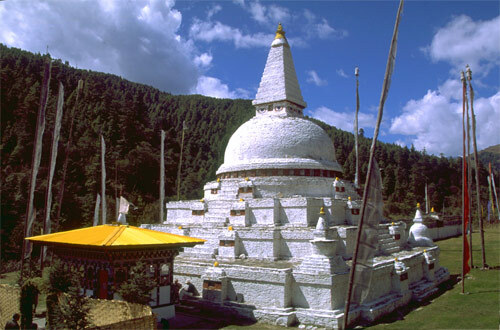 It was founded by Pema Lingpa in the 15th century and was restored by the Grand Queen Mother of the present King. Continue your hike to Tamshing Lhakhang, founded in the early 16th century by Saint Pema Lingpa. Next, visit Konchogsum Lhakhang built in the 8th century. The Temple is famous for its bell, which bears an inscription from the eighth century. Overnight at Hotel. Full Day Itinerary: After breakfast set off on a scenic drive to Ura village, situated 10,000 feet above sea level. About 40-50 closely packed houses alongside cobblestone streets give the village a medieval atmosphere. En route, stop at Serthangla Pass for a view of the Ura Valley below. From here, hike downhill to visit the Ura Temple and then continue to the village of Ura making frequent stops to converse with the villagers and children. Enjoy lunch at a village house, then take time to explore the area. Afterwards, say goodbye to this beautiful village as you return to Bumthang. Accommodations: 2 nights Zhiwa Ling Hotel, Paro. Included meals: Breakfast, lunch & dinner. Full Day Itinerary: After an early breakfast, depart for the spectacular Taktsang Monastery, a site believed to be the birthplace of Buddhism in Bhutan. The Monastery's moniker, which translates as "Tiger's Lair", refers to the tale of Guru Padmasambhava, the Tantric mystic who brought Buddhism to Bhutan and supposedly landed at this site on the back of a flying tiger. 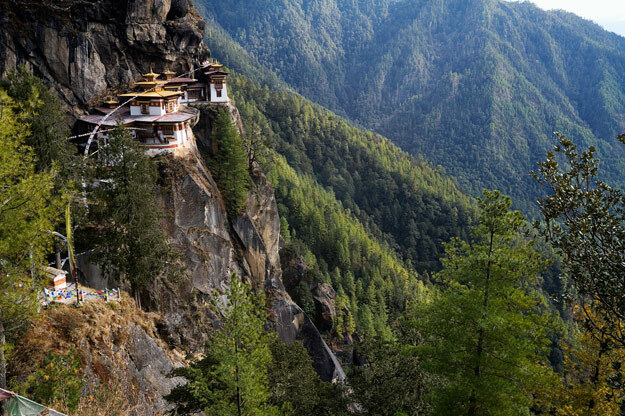 Completed in 1692, the monastery is perched on a cliff 2,300 feet above the Paro Valley. To view the monastery, enjoy a couple-hour hike up along a trail that climbs through a dense pine forest, where you'll see trees festooned with Spanish moss and an occasional grove of fluttering prayer flags. After light refreshments at a rest stop along the way, continue hiking until you clearly see the remains of this magnificent 17th century monastery that sits high atop a sheer rock cliff. Here you'll get a chance to view the interior of this great monastery. Descend the trail for lunch at the cafeteria. After lunch, continue your hike back to the Paro Valley to enjoy the balance of the day at leisure to explore the town. Accommodations: 1 night COMO Metropolitan or similar, Bangkok. Included meals: Breakfast. Or take advantage of your already included airfare and extend your stay in Thailand to enjoy a visit to Phuket! The high altitudes reached on this trip (Pele Pass reaches 10,989 feet above sea level) and the amount of walking involved, often on uneven terrain, require that you be in good physical condition to fully enjoy the trip. As there are several included hikes, we strongly suggest that you consult your physician if you have any concerns regarding your ability to handle these conditions. We recommend to bring more than one pair of hiking boots/shoes and extra socks for your comfort during your trip. 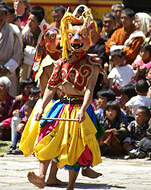 During the festivals, it is customary for the Bhutanese people to wear their finest brightly colored clothing. We suggest to bring a colorful article of clothing to match the festival’s fervor. Itineraries will vary slightly depending on the festival. Travelers will be staying in well-rated and good quality 3, 4, and 5* hotels during their stay in Bhutan. Some of the roads of the rugged Himalayan terrain are winding, bumpy, and can be muddy at times. The National Highway is currently under construction to be widened, and is scheduled to be completed by December 2018. It is suggested to carry motion sickness medication if needed. Two full days at leisure or enjoy an optional excursion! Full Day Itinerary: Two full days at leisure to relax, shop or tour this scenic island, Thailand's largest. 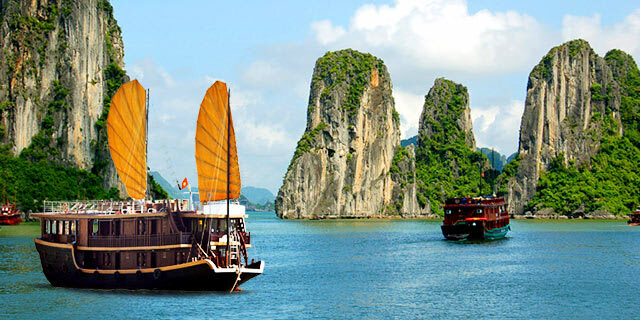 Phuket and the 39 smaller islands to the southeast are studded with tropical forests, mountains, gravity-defying limestone formations, and pristine beaches, surrounded by coral reefs and the aquamarine water of the balmy Andaman Sea. Phuket is a melting pot of Buddhists, Thai-Chinese, Muslims, and even sea gypsies, whom you'll find warm and welcoming. Optional Excursion: Day Tour of Phi Phi Island by Speedboat (purchased locally) Departing this morning, escape to a quieter and more natural side of southern Thailand with this day trip from Phuket. Travel by speedboat across the Andaman Sea to the six scenic Phi Phi Islands. The journey to Phi Phi takes around 45 minutes, passing by spectacular limestone karsts that jut out from the blue seas. Sit back and relax, enjoying the views as the boat cruises closer to paradise. Passengers returning to JFK must leave Phuket early in the morning before the buffet breakfast is served at the hotel and a boxed lunch will be provided. Zhingkham Resort is one of the newest luxury resorts in Punakha. The resort is located among terraces overlooking the Punakha valley. See breathtaking views over terraced rice fields and mountainous landscapes to the Punakha Dzong and Mo Chhu River. 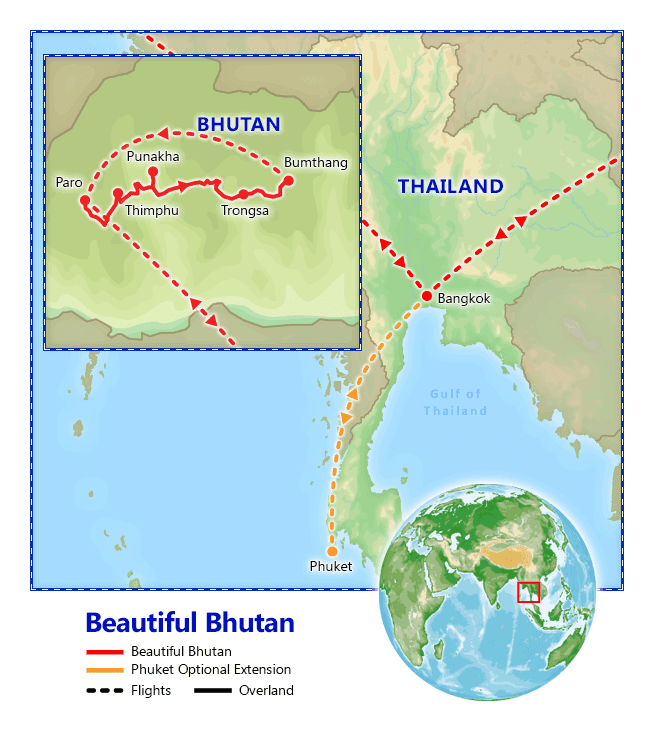 What should I know about Bhutan? Check out our guide for travel tips, the best time to go, blog posts, videos, and more.